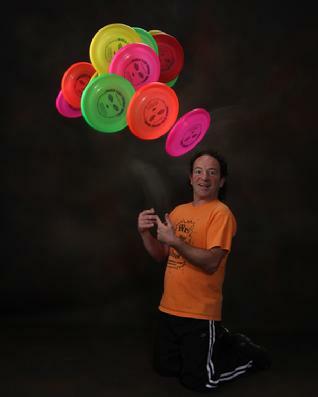 Two-time Freestyle Frisbee Champion, Todd Brodeur, educates, entertains and motivates his audience with captivating Frisbee shows and interactive playshops. He promotes staying active throughout your life by playing disc sports. He focuses on healthy lifestyles, creativity, flexibility and balance, all aimed at improving self-esteem and confidence. World Class Frisbee Shows and Playshops teaches the next generation new ways to learn Frisbee skills that increase hand-eye coordination and all will have fun and success while exercising. Frisbee flipping has been part of American pop culture for over 50 years. Across the globe, the popularity of Frisbee sports has never been greater. Now you and your group can watch a master of the craft and also learn and improve your freestyle skills. This simple space age object will bring fun and excitement to any group or class. Students will be inspired to play more Frisbee, be active, be self-aware and continue to discover.